Since seeing the beautiful Audrey Hepburn as Eliza Dolittle in My Fair Lady as a young girl, and later reading Pygmalion, I have been enamored with London’s flower sellers. So when I saw this book on the “new” shelf at my library, I didn’t think twice about taking it home with me. I didn’t even read the back cover or the first page before jumping right in, and once I did I couldn’t put it down. This is a story within a story. Tilly Harper is a young woman beginning a new life, far away from her country home, as an employee of Mr. Shaw’s Home for Watercress and Flower Girls in London. Florrie and Rosie are children doing their best to survive on the streets of London selling flowers, and looking out for one another. Shortly after she arrives at the Home for Watercress and Flower Girls, Tilly finds a journal that once belonged to Florrie, written more than 30 years earlier. As the story unfolds the great love of Florrie for her little sister Rosie is told along side Tilly’s jealousy of her own sister and the events leading up to their falling out. When Tilly reads of Rosie’s disappearance in the journal she becomes determined to discover what became of the little girl, and in the process learns more about herself than she bargained for. Though I found it a tad predictable, I didn’t think the characters could see the whole picture like I could, and they believably took longer to put the pieces of the puzzle together. It is more than a historical drama. It is a story of love and redemption. It is a story of self realization, for more than one character. It is as beautifully told as the flowers in the story. That alone makes for a great novel, but the part that really captured me, was the truth behind the novel. Hazel Gaynor goes above and beyond by sharing her inspiration for the book with us. She shares fascinating additional resources that she came across while researching the book, and the story of the man who inspired her character, Mr. Shaw. 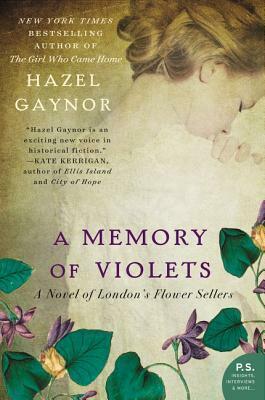 I love to learn new things through historical fiction, Hazel Gaynor helps take the challenge out of it. I can follow her carefully researched path to more knowledge on the subjects instead of stumbling down my own. It’s kind of a two in one fiction/non-fiction book. Because of all this, I will certainly be watching for more books from her in the future. Curious about some of the themes in A Memory of Violets? Here’s some additional reading.